Magnify Apps exists to help small businesses and ministries design and develop affordable mobile applications to expand their marketing reach. 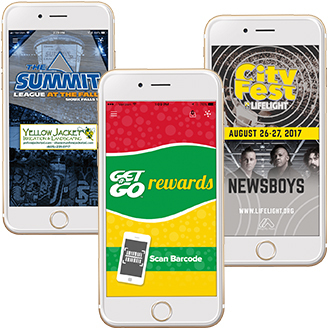 From Push Notifications to Loyalty Cards we help you connect with your audience. Get started today by learning more about our app services or check out some of our past work. “The mobile device has become our communication hub, our diary, our entertainment portal, our primary source of media consumption, our wallet and our gateway to real-time information tailored to our needs." Reaching your Sunday congregation on the other 6 days of the week can be tough. Members who aren’t involved in church activities outside the regular service—especially newcomers—tend to feel slightly isolated from the community. LifeLight CityFest Music Festival in Sioux Falls, SD Canaries Stadium.